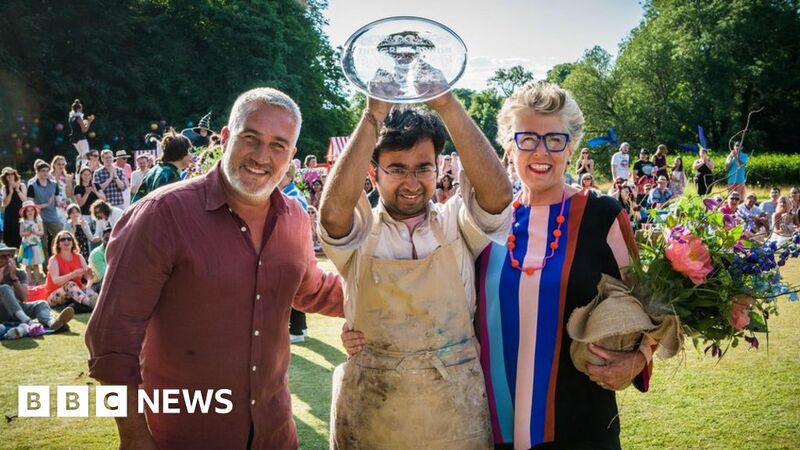 Rahul Mandal has won this year’s Great British Bake Off, triumphing over fellow finalists Kim-Joy Hewlett and Ruby Bhogal. Rahul was crowned 2018’s winner after a near-disaster in the show stopper. The final three contestants were evenly matched, having each been named star baker twice during the course of this year’s series. The latest series has been a ratings success for Channel 4, who took over the show last year following its move from the BBC. And there was no repeat of last year’s embarrassing gaffe that saw judge Prue Leith accidentally tweet the winner before the programme aired. In the signature challenge, the bakers were called upon to make two batches of iced doughnuts – one set filled and one set rings. Kim-Joy, who lives in Leeds, impressed with her amaretto creme diplomat doughnuts. Said Leith: “I might come back and eat that”. And Hollywood praised London-based Ruby’s doughnuts adorned with chocolate rainbows: “They have great designs on the top and the decoration is very clever”. In a Bake Off first, the three finalists were then asked to take their cooking tools outside for a tough technical challenge. Hollywood tasked the trio with making six pita breads and three dips in 90 minutes, using campfires for all the cooking. Kim-Joy, a mental health specialist, won the technical for the first time. Research scientist Rahul came in second and project manager Ruby took third. But it all came down to the show stopper to see who would take the crown. The finalists were given four-and-a-half hours to make a landscape dessert, painting a picture with cake, pastry and biscuits. Drama ensued as Rahul created a rock garden, inspired by Victorian explorers bringing back exciting plants from around the world. But his glass storage container smashed due to the 32C heat in the tent and after a swift clean up by producers he had to start again – with an extra 15 minutes to make up for lost time. Kim-Joy’s Lost city of Atlantis was also applauded for being “original and colourful”. But there were some questions on the amount of ginger she used in her biscuits and cakes – recipes that won her star baker in spice week. Ruby’s magical landscape, with unicorns and mushrooms, was praised for its theme. The choux pastry mountain impressed with its height, despite being overcooked, whilst both judges praised the delicious flavours, beautiful sponge and buttery biscuits. But the taste and complexity of Rahul’s final bake saw him come back from the brink of disaster to win the final. Hollywood added: “He is one of those characters that you will miss when you are not with him.